Mega Power Star RamCharan, Samantha Akkineni, Devi Sri Prasad and Sukumar Combination much awaiting Rangasthalam Movie Lyrical Title song released today. Listen Ramcharan Rangasthalam Lyrical Title Song Exclusively on Amaravathi News Times. 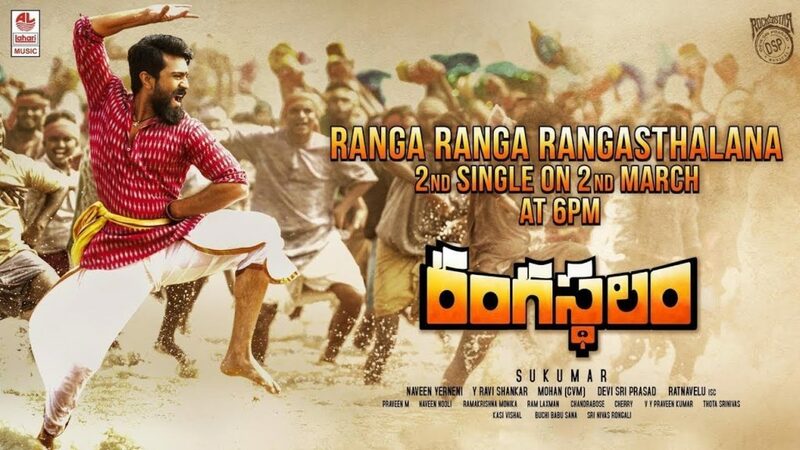 The Single sound track of ‘Ranga Ranga Rangasthalana’ song from ‘Rangasthalam Movie’ releasing today 02.03.2018 at 6 pm. Ramcharan, Sukumar Combination Rangasthalam Movie git much hype in Tollywood Industry. Rangasthalam is a village name revealed by Director Sukumar. Recently Mega Star Chiranjeevi and Star Director S.S. Rajamouli Visited the set of Rangasthalam Village. Ramcharan is playing deaf man character role in this Movie. Village guy who has creative Engineering talent and Ramcharan, Samantha Performance, Dances, screenplay, Story Music and Direction is going to be a huge asset for the Movie. The Rangasthalam movie is making with a whopping budget around 60 Crores. Rangasthalam Movie is Story of 1980’s periodical Drama. Rangasthalam Movie is all set to release on 30 March 2018 this year. RamCharan, Samantha, Aadhi Pinisetty, Shruti Haasan, Pooja Hegde(Special Song), Prakash Raj, Jagapathi Babu, Gauthami, Anasuya Bharadwaj, Rajesh Diwakar Starring ‘Rangasthalam Movie’ is Directing by Sukumar, Music composed by Devi Sri Prasad, Producing by Naveen Yerneni, Y Ravi Shankar and Mohan Cherukuri Under Mythri Movie Makers Banner, DOP by R. Rathnavelu, Editing by Naveen Nooli, Art Direction by Rama Krishna Monika, Fights composed by Ram – Laxman, Lyrics written by Chandrabose, Story and Dialogues Written by Thota Srinivas, Kasi Vishal, Buchi Babu Sana, Srinivas Rongali and Audio Music releasing by Lahari Music.